TSRs have enormous importance to biodiversity. They protect endangered ecological communities (EECs) and threatened species in heavily cleared areas and play an important role in connectivity conservation and helping native species to cope with climate change. While the North Coast in general and the Clarence Valley LGA in particular are well endowed with National Parks and Nature Reserves, they are on land that was not suitable for clearing for agricultural uses, such as rocky outcrops and ridge lines. These areas generally have poorer soils and do not support the vegetation types and habitats that occur on the fertile valley floors with creek lines, rivers and rich alluvial soils. The TSR network, however, mostly occurs on these fertile valley floors because it was developed along a series of reliable water sources, often following traditional Aboriginal pathways through the landscape. Therefore, the vegetation and habitats contained in TSRs are, in many cases, the best remnants of woodland ecosystems that are adapted to fertile soil conditions. They must be maintained. The network of travelling stock routes throughout NSW and Queensland in particular provides the opportunity to apply the principles of connectivity conservation or “biolinks”. TSRs act as corridors and stepping stones, connecting fragmented vegetation across the landscape. In particular, they connect the remnants of a north-south corridor of woodland in eastern Australia. Temperate Australian woodlands, such as the Box and Ironbark woodlands, once covered extensive areas of the Western Slopes and Tablelands from Queensland to the Riverina. They were home to a huge variety of plants and animals. The advance of wheat and sheep farming changed this situation, and vast areas were cleared. Because TSRs have been retained as public land, they were not cleared for grazing and cropping, and woodland remnants were preserved. Many birds and mammals need tree hollows for breeding. These habitat trees generally take a minimum of 70 years to develop. Gibbons and Lindenmayer (Tree Hollows and Wildlife Conservation in Australia, 2002) have shown that more than 300 species of Australian native animals – mammals, birds, reptiles and amphibians – depend on hollow-bearing trees for their survival. The occurrence of a natural range of hollow sizes, depths, volumes and positions helps to ensure that a diversity of hollows is available to cater for the special ecological requirements of all of these animals. Without the TSR network these habitat trees would not have survived. Although the TSR network is less widely used than in years past, the ability of TSRs to provide emergency feed and agistment during times of drought, fire and flood is obviously of considerable economic benefit to primary industry. TSRs also provide a valuable resource for apiarists. A study by Dr. Ian Curtis and Tristan Knowles (The economic value of ecological goods and services provided by selected Travelling Stock Routes in New South Wales, 2012) concluded that the ecosystem service values of TSRs to the public are of the order of $1,870 per hectare. In 1998 a brochure, “Bird Routes of the Barraba Shire”, was produced by the Birdwatchers of Barraba, based on the network of old drovers’ routes linking the TSRs. It won a National Award for Innovation in Local Government – Environment Section and started a flourishing ecotourist industry in the area. Today, dozens of such brochures underpin a flourishing ecotourism industry. 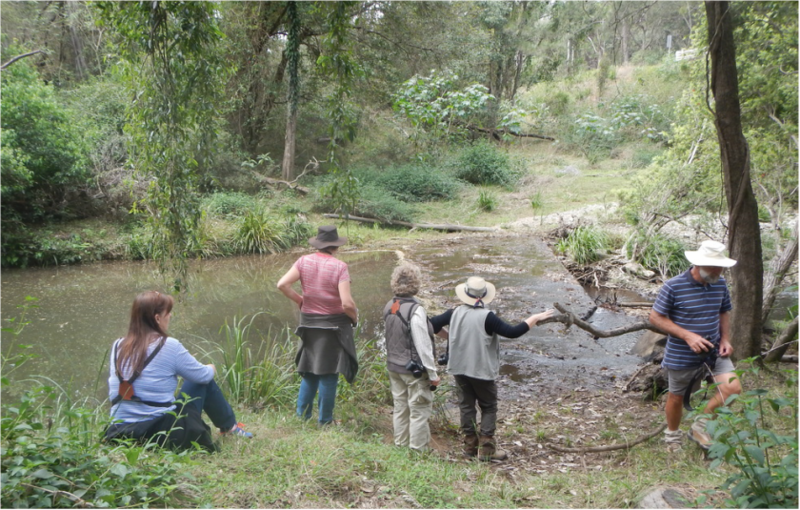 In our area, “Bird Routes of the Clarence Valley” has attracted hundreds of individuals and numerous birdwatching groups. The Long Paddock Touring Route follows the stock route and TSRs along the Cobb Highway from Echuca through to Wilcannia and on to the outback towns of Bourke, Broken Hill and White Cliffs. It takes visitors through some of the most historically important agricultural country in Australia. Properly managed, the potential of TSRs for ecotourism and historic tourism is enormous. “The Long Paddock” is part of Australian culture, renowned in poem and song – “Clancy of the Overflow” and “Saltbush Bill” by Banjo Paterson, “Andy’s Gone with Cattle” by Henry Lawson and “Heading South Through the Long Paddock” by John Kinsella are just a few examples. In many cases it would appear that travelling stock routes developed from Aboriginal travel lines, as these routes often followed the most accessible routes through the landscape, avoiding natural obstacles and linking water sources. Many TSRs may have developed by transfer of knowledge from Aboriginal guides and trackers, and workers in the pastoral industry, or by early Europeans observing the physical signs of traditional pathways and adopting them. Traditional camping places have also been gazetted as travelling stock reserves. The presence of scarred trees, middens and artefacts on many TSRs is evidence of the traditional spiritual and cultural connections of Aboriginal people with these areas. The TSR network provides for many recreational uses – bushwalking, picnicking, swimming, horse riding, fishing, cycling and birdwatching. It is important in our increasingly urbanised society that people have the opportunity to experience the recreational opportunities the TSR network provides. As TSRs have been retained as public land, important woodland remnants have been preserved. TSRs act as corridors and stepping stones, connecting fragmented vegetation across the landscape. To allow industrial logging would destroy the biolinks that the TSR network provides. Collecting firewood removes key shelter and breeding sites for birds, reptiles and ground dwelling fauna. Decaying timber also provides important functions for soil building, moisture retention and fungal activity, which are compromised when the timber is removed from TSRs. Illegal tree felling for fence posts and firewood removes vital habitat components such as tree hollows, and causes disturbance of the understorey. Exploration with large drilling rigs, construction of infrastructure such as gas pipelines and the National Broadband Network, and widening of roads are all potential threats to the environmental integrity of the TSR network. Recently, there has been increasing pressure for coal seam gas pipelines and similar to be constructed along TSRs in order to avoid privately owned agricultural land. Since early March 2011, the NSW Coalition’s Strategic Regional Land Use Policy commits to “...promoting the use of crown land, such as Travelling Stock Routes, for pipeline routes where viable and the establishment of energy and transport corridors.” Valley Watch considers this to be totally unacceptable. Valley Watch believes that the travelling stock route network must be retained in public ownership and managed to maintain biodiversity, natural habitat connectivity and cultural heritage values. There should be a moratorium on granting long-term grazing leases to prevent short term, ad-hoc decision-making and environmental degradation of the TSR network until appropriate management frameworks are in place. TSRs need to be managed in accordance with a State Planning Framework that recognises the connectivity of the TSR network. Key stakeholders, including community and conservation groups, must be consulted in the further development of the Planning Framework and in the development of regional management plans and local operational schedules.